Canada Road could not have been nicer. Not too much wind and mild temperatures. Can you believe it was 52 degrees this morning? While the rest of the West burns to a crisp, we’re nice and cool. 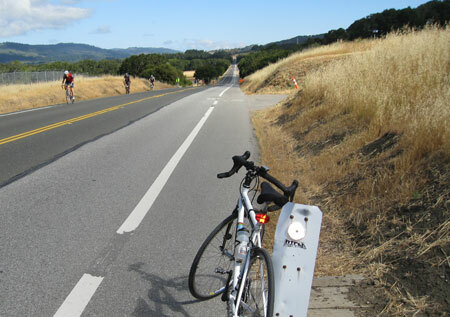 As I proceeded on Arastradero Road I passed two Sheriffs on motorcycles handing out tickets to cyclists. I guess today was their day for doing that thankless job. I avoided the tickets and continued through Portola Valley, passing the shuttered Portola Valley Nursery. I guess it has been shut down for a while but never noticed. Just to make things interesting I took Albion Avenue over to Olive Hill Lane. I hadn’t ridden those roads in at least 25 years. I wanted to check out the Crystal Springs Dam work, but the road is closed about a half mile before the dam. The road is supposed to re-open in December. On my return I stopped by to see Jobst Brandt. He seemed in pretty good spirits. When I noticed his 48-spoke wheel I expressed my surprise and he had a good one-liner. “Weird.” That Super Champion rim with Phil Wood hub has been sitting in his house for eons. Waiting for a tandem rider who needs one I guess. 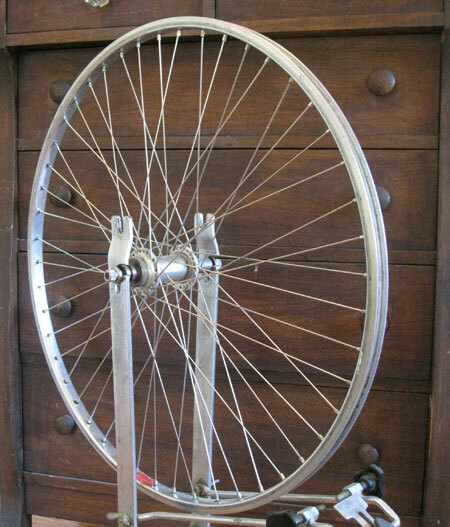 And you thought 36 spokes was a lot. This wheel has 48. Built to last. This entry was posted on June 24, 2012 at 9:05 pm and is filed under News. You can follow any responses to this entry through the RSS 2.0 feed. You can leave a response, or trackback from your own site. Where were they ticketing on Arastradero? I usually see them at the intersection of Alpine and Portola, or else in Woodside. Arastradero Road at the 280 overpass and just west of Page Mill Road and Arastradero road intersection.